Capture attendance using tablets, iPads or your phones! 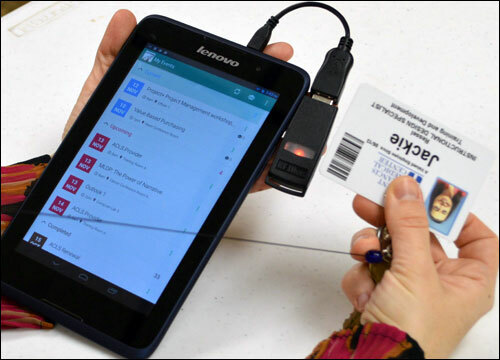 A Saint Francis Medical Center employee taps her ID badge to an RF IDeas dongle reader, which is plugged into an Android-based tablet running the i-Attend Capture app. 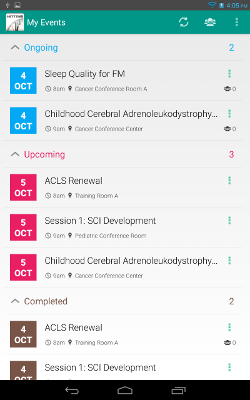 Each night, the medical center's training program department downloads data related to the coming day's sessions from i-Attend Cloud onto the tablets to be used. Those tablets are then charged during the night, and are assigned to staff members who manage attendance the next day. 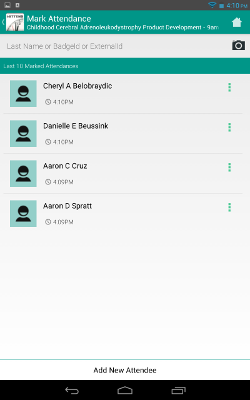 Track attendance using your smartphones, tablets or iPads. i-Attend Capture is an application that runs on mobile devices such as your tablets or smartphones. It is used in conjunction with i-Attend Cloud. The app supports both RFID and Barcode authentication mechanisms for attendee identification. It also supports attendee lookup as a backup in case ID Badges are not available. 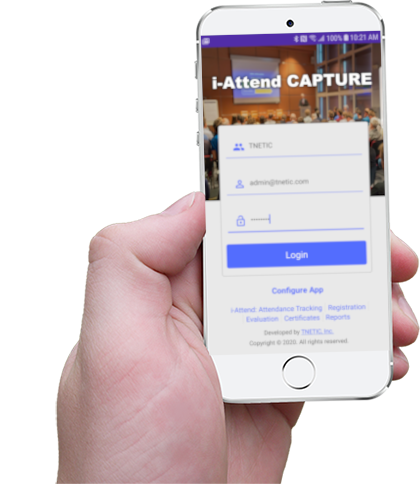 i-Attend Capture provides the ability to download and sync event and attendee data with i-Attend Cloud. 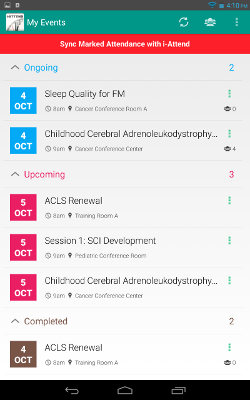 This allows your tablet or smartphone to have the most current information regarding current and upcoming events along with attendee and their badge information. By RFID – use the available microUSB to attach a wedge RFID reader. Devices that have a microUSB port usually tablets. By Barcode – touch the camera icon and your device will use the autofocus function of the camera. The ability of the camera to autofocus well will affect scanning of barcodes. Type Lastname – type the first two characters of your attendee and a list will appear allowing you to select your attendee. Add New Attendee - if attendee does not exist in the current list, you can tap the Add New Attendee option which allows you to add the attendee and include in attendance. 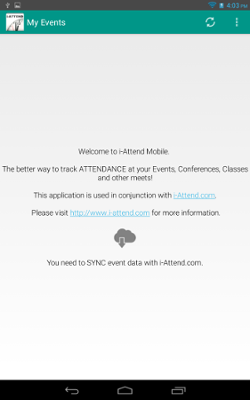 After capturing attendance, you can now upload captured data back to i-Attend Cloud by simply tapping the RED BAR on the screen. After syncing your data from all your mobile devices, run your reports in the Cloud or distribute your certificates and evaluations. Sign-up for a live demo and a 15-day free trial!